This entry was posted on Wednesday, June 15th, 2011 at 11:21 am and is filed under Computing. You can follow any responses to this entry through the RSS 2.0 feed. You can leave a response, or trackback from your own site. 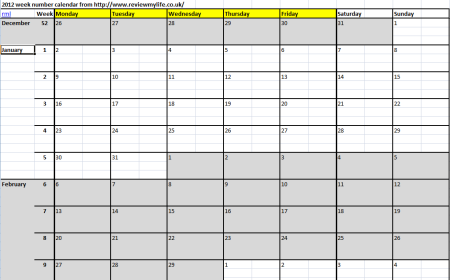 I am looking for a calender which starts on Saturday and has week numbers? Hi Cleo, you could try editing this calendar if you wanted it to start on a Saturday. You could cut the Saturday and Sunday columns and then paste them onto the start of the calendar (before Monday), but offset down to the next week. Hi, do you have the 2013 version resdy for this calendar?